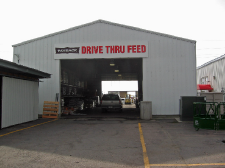 We stock a full line of pet and livestock feeds in smaller quantities, available at the convenient drive-through feed store at our Missoula Ranch & Home location. With brands like Payback, Purina, Golden Harvest, Allegra, Equis, Pfaus, Diamond, Nutro and North American Salt, we can meet all your feed needs with a quality product. No lugging feed bags from the back of store. Our helpful and knowledgeable staff will assist you while you sit in the comfort of your vehicle. Stop in today and we will help you the best food for your furry friends.